It should come as no surprise that my favorite thing to make and consume is dessert. There’s even an early home movie of me from my brother’s birthday party, deep in the throes of speech impediment-dom, where my mom asks who would like more cake. Still shoveling the stuff in with one hand, face caked (literally), I wave my hand wildly in the air and spew out over top of the cake currently in my mouth, “Muh!” (cake-speak for “me”). Tiny human gluttony at its finest. And while, frankly, most of the time, that is how I would still prefer to enjoy my desserts, I’ve learned that many of the best desserts on the planet are the richest, and best enjoyed with just a couple of bites, otherwise the risk of indigestion, too-full-ness and displeasure is certain. Five months ago I left a job that felt much like losing a third arm after having it your entire life – a completely abnormal appendage that you’d actually grown very attached to and found useful despite the stares and concerns of others. I found that the job, like those aforementioned decadent desserts, was overpowering in the best way, endlessly rich, yet not a recommended part of a daily, healthy long-term diet. Somehow along the way, my life’s “diet,” so to speak had been thrown completely out of whack, and I needed to reclaim some space on my plate. I’d lost my equilibrium. I’d lost the ability, seemingly, to filter stress or operate at a level that wasn’t 140% at all times. I didn’t know what it was like to not very, very tangibly feel adrenaline coursing through my body (it makes your extremities feel numb, your face to pulsate, and to have tunnel hearing… 20 hours a day, in case you were wondering, even then, I loved that. I loved that feeling, and frankly, though I love my job now, there are times that I miss it). I couldn’t imagine doing anything else that wasn’t at that level of being. That didn’t make me feel so alive, so proud, so accomplished. But, then, when I got married, something shifted. I realized that my marriage made me feel all of those wonderful things, but that I couldn’t be fully present in it while the rest of my life was so out of control. I found myself with constantly frayed nerves, a permanent feeling of crushing guilt, and a deep sadness that I couldn’t do all the things that felt so vital at one point. Then, my life was jolted even further when we discovered that we were in the midst of a very real, very scary (oh, so scary) infertility struggle, and I knew that I couldn’t stay. That third arm that I’d grown to love, was actually just not helpful anymore and had become a kind of dead weight (ew, I was trying to come up with an analogy about those people who eat their twins in utero, so I Googled that, and now I’m not hungry for lunch – or probably any food ever again). So, I walked away. Tearfully and bittersweetly, I walked away. To reclaim my marriage, to reclaim the pieces of me and my faith that were not exclusively tied to the job, to stop being a spectator in the lives of the people I loved most, and to focus on being healthy and full so we could tackle this new hurdle head on, strongly and correctly. The sweet dessert that I’d loved needed to be passed to someone else to taste, so that I could breathe. And eat some kale or Brussels sprouts or something. Reclaiming “normal” (if such a thing even exists) hasn’t been the easiest process. And five months later, I’ve found that the things I need most are the mundane. The things that add stability and make me feel alive and present in a different way. Cooking, writing, worship, yoga – things that make me feel empowered and enriched. Even terribly crappy reality TV (not super enriching, per se, but dang, it’s just so… terrible). 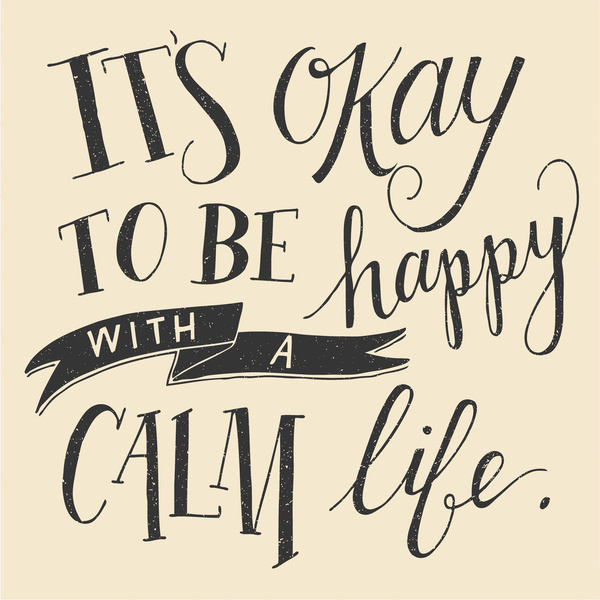 Before I left my old job, Erin posted a graphic on one of the social mediums that said, “It’s okay to be happy with a calm life,” and I clung to that (it’s the wallpaper on my phone, currently), and I believe that wholeheartedly and preach it to myself often. I miss my old job nearly daily. I miss the people that I worked with, the experiences I got to be a part of, but after five months away, I’m starting to unpack the things that I did experience, and I’m appreciating those in a more acute way. Five months later, and I feel content in a way I haven’t in a couple of years. I feel like my lungs (literally and figuratively, really) can properly inhale and properly exhale. And I’m learning that it’s okay to walk away from something that was really, really good and really, really wonderful, because God directs paths that lead to things even more wonderful and even more fulfilling at His appointed time. Recently I gave a friend who was struggling a bag of kettle corn, and I wrote her a note that essentially said that it isn’t a secret to me anymore why the flavor profile of sweet-and-savory is so delicious, because I truly believe in life that crying salty tears often paves the way to enjoyment of the truly sweet. And so this isn’t a post without a recipe, I have been devouring Brownie Batter Protein Overnight Oats every morning this week. And I want you to do the same. Because they are basically the best thing that’s happened to me recently. A couple of tweaks I’ve made: I add an additional 1/2 tablespoon of cocoa, 2 tablespoons of chia seeds, and an extra splash of almond milk (to offset the addition of the chia seeds). I also do not use Stevia for a number of reasons, so I just sub it out for a little less than 2 tablespoons of sugar instead. I use vanilla protein powder, and I top the whole shebang with banana slices and raw pecan pieces before eating it out of a mason jar.